I grew up in a family that doesn’t celebrate Christmas, however in a country where it’s almost Christmas from the moment September kicks in, it’s impossible for me not to feel the festive air nor have memories about it. Back in the days, I remember that the school wraps up the year with a Christmas party. Whether I celebrate Christmas or not, I still get the benefit of the long break from the 3rd week of December till the 1st week of January. From the first week of December, my classmates will start talking about their upcoming vacations. Some will go to their provinces and although Rizal is a province itself, some have families in other provinces like Quezon, Marinduque, Ilocos, Cagayan or Bicol. Some will talk about how they are preparing for their family exchange gifts and some, about the cakes and cookies and muffins that they will bake for Christmas or what new clothes or shoes will they buy and wear for Noche Buena. For me, Christmas breaks meant business. I started helping my mom with our RTW (ready to wear) shop in the public market when I was eleven. We used to wake up at 3am, leave Rizal by 4am and head to Baclaran to buy goods, come back to Rizal before 8am if possible, arrange the goods and start selling till closing time which is at 8 to 9 in the evening. It was just the two of us as my father minded his own business of driving his jeep or fixing ten wheeler trucks. I was the eldest among 4 kids; hence we never expected the younger ones to help. I was one skin and bone kid, not even a teenager, when I started carrying bags of goods heavier than me on both shoulders. We would walk along the muddy streets of Pasay till we reach the point where the bus stops. And we don’t take the air-conditioned bus. Me and my mom will take those ‘kings of the roads’ like MaFel or Nova – the types of buses which can reach Litex from Baclaran in 45mins or less. If you are a daily EDSA commuter, you’ll know what I’m saying. There were times when I felt like I was deprived of childhood, though as I said, we don’t celebrate Christmas, at least the joys of playing with all the kids in the neighborhood during this season or just the pleasure of waking up late and having breakfast while watching kid’s shows in the morning almost never happened. If so, rarely. I felt sad sometimes and jealous of my friends, though at a very early age, I was made to understand that I was not born with a silver spoon and if I would not help my parents, then who will? I saw how hard my parents worked their asses off, and I felt ashamed of myself to even feel sad for being deprived of my childhood. So I worked hard too. I saw how the thousands of money we earn each day are getting burned up afterwards. We earn so much only to pay bills after bills, loan after loan. So I worked even harder but there was a time when my young body wasn’t able to cope up. Like a fruit, I guess, I was harvested before the right time. One afternoon when I was selling clothes to four ladies, I suddenly felt dizzy. My saliva started to taste weird. I tried to keep myself composed for I saw my mom around three to four customers as well that time. She can’t cover me so I needed to finish up with the four ladies before taking a rest. I tried to answer only yes or no to their questions without further explanations as I can’t talk anymore. But I wasn’t able to hold it any longer. I ran to the toilet and threw up. I saw my mom’s face as I came out of the toilet. Her expression said she was more than worried. She knew that I was not a sickly child. I was skinny but I was healthy. And she knew how I can endure sickness and pain, that when my body surrenders, that’s really about it. We closed the shop earlier that day. We didn’t accept any customers after 6:30pm even though a lot were still rushing in. I wasn’t really sick, just over fatigue with an unfortunate combination of incomplete sleep, missed meal times and physical exhaustion. This was a one off incident but something I won’t forget as the earlier you experience something, the clearer is the imprint on your memories. It was the same every year. Christmas meant business. At some point, I stopped dreaming of childhood and vacation. I got used to it. Incomplete sleep, missed meal times, and physical exhaustion. Oily face, muddy feet, and dirty hands from handling money all day long. It became a usual yearly event. And this yearly event has now become memories. We all have different circumstances in life, and this was mine. Lucky are those who have fond memories of Christmas especially during their childhood days. I’m not saying I’m not lucky. I just have a memory of the season that is very different from every one else’s. PS: If by any chance you have also read Biyaheng Cubao, you might be wondering how colorful my younger life was. 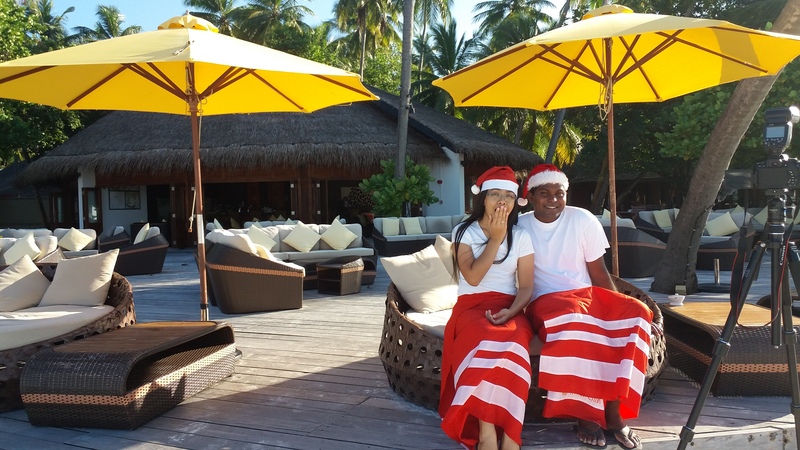 And by the way, Happy Holidays from the Maldives! I admire children who give their all to help the family. Napakabait mong anak Aysa! Btw, just curious, is it by choice that you don’t celebrate Christmas or because it’s unscriptural? when you’re a kid, Christmas is fun. You have gifts, you eat a lot. You see a lot of fireworks. It’s festive. But as an adult, Christmas has become commercialized. It took out the fun. A lot of stressed out adults trying to budget their salaries to buy gifts. I don’t know. I suddenly felt Christmas is so overrated, it’s not fun anymore. bitter lang ako kasi walang nagreregalo sa akin.. hahahahaha! I’m impressed reading your childhood memories. You’re an epitome of a hard-working kid. And you turned out great. Prodigal Daughter, pwede ba yon? hahaha! anu ba yan nakakalungkot. hmmm. pero ang masaya nalampasan mo na at nananatili na lang itong ala-ala para magpursige. I call those the “killer buses”! Exciting namang sumakay, mabilis ang biyahe. My memories of Christmas as a child were happy – that was when I was still the youngest. I always looked forward to my new “pamasko” when this season approaches. But it changed ng madagdagan kami ng dalawa pa. Parang mas naging mahirap ang buhay! But you can now celebrate Christmas however you may wish. How does that make you feel now? Ha ha, you are lucky to have happy memories. I don’t celebrate Christmas till now.